I love maple fudge and originally went in search of a maple fudge recipe when I stumbled upon this maple pumpkin fudge. It's the perfect fall/holiday recipe and seems fairly fool proof - I actually let it get a bit too hot (up to 239 degrees) and it still turned out just fine. Just imagine pumpkin pie filling with maple syrup in it, in convenient bite size servings... that is what this fudge tastes like! The maple flavor is certainly there; I'd say it's a good blend of maple of pumpkin... but if you want a predominantly maple fudge with pumpkin undertones, then I would suggest adding maple extract for a stronger maple flavor. So if you're doing some last minute baking in the days leading up to Christmas, try this unique fudge recipe and let me know what you think. 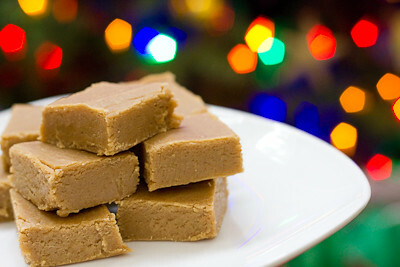 I'd still like to find a good plain old maple fudge recipe, too, so if you've got one, please leave me a link in the comments section below! Line a 12×8″ baking dish with foil, letting it hang over the edges. In a large sauce pan, whisk together the sugars, butter, evaporated milk, pumpkin, and spices. Bring to a foil over medium heat, stirring constantly. Continue boiling for 10-12 minutes or until the candy thermometer registers 235 degrees Fahrenheit – soft ball stage (soft ball stage occurs when you drop some of the mixture into a bowl of cold water, and it forms a “soft ball” when it cools and is removed from the water). Stir in the white chocolate chips first, and then the marshmallows or marshmallow crème and maple syrup. Stir until melted, and then immediately pour into the prepared pan. Let cool on a wire rack for 2 hours or until completely cooled. To cut, lift the foil from the ends of the dish. Cut the fudge into 1″ squares. Store in the refrigerator or freezer. 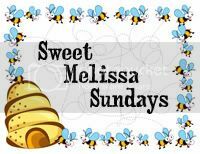 Ok, so I wasn't able to finish posting all of my holiday posts yesterday before the kids started needing my attention. Today I'll finish off the series with some fudge recipes. 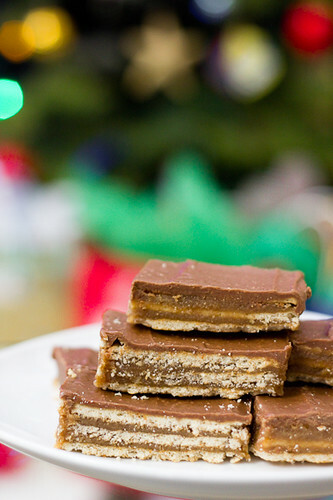 What holiday baking list would be complete without fudge? I love fudge. Every variety of it - chocolate, peanut butter, chocolate with peanut butter, and maple. This year I tried two new flavors of fudge: White chocolate cranberry and maple pumpkin (the latter will be my next post). This white chocolate fudge recipe is nice because it doesn't require the use of a candy thermometer. 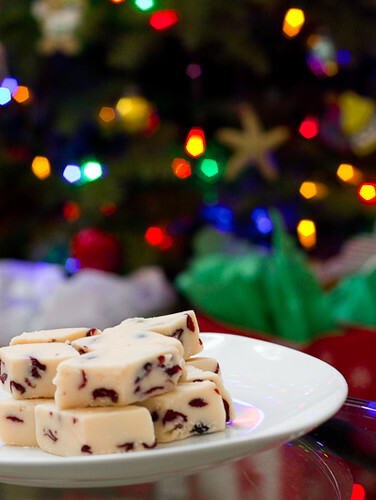 I actually made this pink white chocolate cranberry fudge the first time in November for my daughter's birthday party. I needed both pink and purple desserts and stumbled upon this fudge recipe while browsing the web. I love white chocolate (even though my husband gets on me for it not being "real" chocolate), so I knew I'd love this fudge. I omitted the nuts because I never put nuts in my baked goods, but the cranberries were a welcome addition. The original recipe calls for cherries, but I did not have those on hand. The dried cranberries work well as a substitute, as they are both tart and sweet. Everyone who tried this at the party loved it, so if you're looking for something a little bit different this holiday season, I'd encourage you to try this fudge. Line an 8x8x2-inch baking pan with foil (I used a 9x9 inch pan). Butter foil and set aside. Combine sugar, cream and butter in a heavy 2-quart saucepan. Cook and stir over low heat until blended. Increase heat to medium. Bring to a boil. Boil for 5 minutes, stirring constantly. Remove from heat and stir in marshmallows and white chocolate chips. Stir until chocolate is melted. Stir in cranberries, enough food coloring to turn fudge pink (3-4 drops) and nuts, mixing until well blended. Spoon into prepared pan. Refrigerate until firm. Cut into squares. Store tightly covered in refrigerator for up to a month. Have you tried these crunchers yet? I've seen variations of this recipe, or similar recipes, made with saltine crackers as well. I've been seeing them on various blogs and on pinterest for a few years now. Every time I see them, I've said I want to try them but I've never gotten around to it because I never have butterscotch chips on hand in my pantry. I love the salty and sweet combination (chocolate covered pretzels are among my favorite!) and when you're baking several different things for the holidays, it's nice to have a few recipes that are simple and quick to prepare. 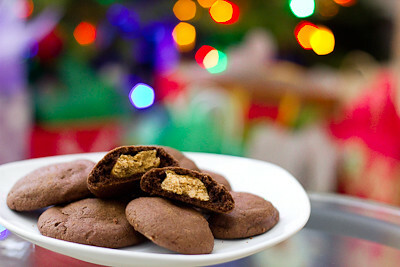 This recipe is basically club crackers with layers of caramel-type filling in between, topped with a chocolate peanut butter layer. The best part - they can be made in under 15 minutes. My only issue with them is that they are best when kept refrigerated. After they are taken out of the refrigerator, the chocolate layer on top starts to get very soft and easily smudged. So, these wouldn't be the best goodies to ship out if you're looking to mail some holiday goodies. Don't let that stop you from trying these though because for such minimal effort, these are really good! Line a 9x13-inch baking pan with foil, leaving an extension of foil on either end. Line the foil with 1 layer of club crackers, cutting to fit if necessary. In a heavy bottom large saucepan, melt butter over medium heat. Add graham cracker crumbs, brown sugar, milk and sugar. Bring to a boil and boil for 5 minutes, stirring constantly. Moderate heat and reduce as needed so mixture doesn't stick to the bottom and mixture doesn't boil too hard (this can cause butter to separate). Remove from heat and spread half of butter mixture evenly over crackers. Place another single layer of crackers evenly over butter mixture, cutting to fit if necessary. Spread remaining butter mixture evenly over crackers. Top evenly with remaining crackers. In a small saucepan, combine peanut butter, chocolate chips, and butterscotch chips. Melt over medium-low heat, stirring constantly. Spread evenly over top of crackers. Cover, and chill for at least 1 hour. Lift foil overhang and remove bars from pan. Cut into bars. Store in the refrigerator. One of the first food blogs I ever started following was Peabody's blog, Culinary Concoctions by Peabody. Everything she makes looks amazing - I truly wish I was one of her friends so I could have the pleasure of eating all of it ;) So, when I went in search of recipes to try this holiday season, I knew that I could surely find something wonderful to make from there. And I was right. After scrolling through a few posts, I stumbled upon these pumpkin gingerdoodle cookies. Part pumpkin snickerdoodle and part gingersnap cookie, these cookies combine some of everyone's favorite holiday flavors. My husband walked into the kitchen and saw me pulling these out of the oven and asked, "Can I have a snickerdoodle?" I informed him they weren't snickerdoodles but pumpkin gingerdoodles and he was happy to try them. 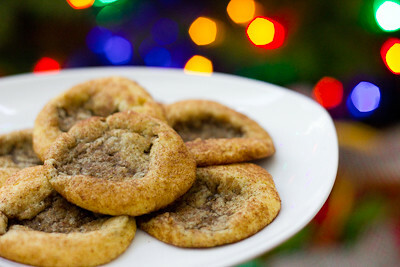 He quickly proclaimed, "These are way better than regular snickerdoodles." I only had two issues with these cookies. The first issue was really a non-issue: I had way more pumpkin snickerdoodle dough than gingersnap dough. So in the end, I made some plain pumpkin snickerdoodle cookies as well (all were eagerly consumed regardless). The second issue was in the consistency of the cookies. The pumpkin snickerdoodle dough puffed up into a wonderful moist, slightly cakey cookie. The gingersnap dough, on the other hand, puffed up but deflated after I pulled it out of the oven. So, my cookies looked lopsided when I placed the cookie doughs side by side. Next I tried a batch with the pumpkin snickerdoodle dough on the bottom and the gingersnap dough on top. Those turned out okay, but they weren't very aesthetically pleasing. So finally I made a batch with the gingersnap dough on the bottom and the pumpkin snickerdoodle dough on top and those cookies turned out to the look the best. I'm not sure how Peabody got her cookies to look the way that she did, but the cookies you see in the photo at the top of this blog post were the best that I could do. Regardless of how these cookies look, they are amazing. We couldn't stop eating them in our household and almost didn't have enough to give out to family and friends because we wanted them all to ourselves! So, if you're going to only try one new recipe out this holiday season, I encourage you to make it this one - I promise you won't regret it! Add in flour, cream of tartar, baking soda and salt and mix on low until fully combined. Set aside. Cream together butter and sugar. Add molasses and egg and continue beating. Add flour, baking soda, salt, cinnamon, cloves, and ginger and mix until combined, scraping down the sides of the bowl as needed. Wow, has it been a crazy few months. I can't believe that it's been over three months since my last blog post?! I thought that with my daughter starting school in September, I'd have all this extra time to bake and blog again. However, as many moms out there know - your time without the kids is rare - so I found myself running a million different errands every time she was in school and I was never home to do any baking. I kept thinking to myself that I'd get around to another post "soon" and then before I knew it, I was busy getting ready for my daughter's third birthday party and then a few days later I had my baby girl! Life's been crazy with a newborn and a three year old, to say the least. For those who have been following my blog for some time and would like to see some pictures of the new little one, you can visit our photographer's blog here. I'm so blessed to be celebrating this holiday with two beautiful little girls that are the light of my life. And without further ado, I'm hoping to post a flurry of blog posts today to make up for my lack of blogging over the past few months (hopefully the kids will nap long enough for me to get these all up today!). For those who are still looking for some last minute inspiration for their holiday baking, look no further :) I've got some great recipes that I've tried out this year, and of course there are the tried and true recipes from years past as well. Let's start off this series of posts with one of my favorite combinations - peanut butter and chocolate. You really can't go wrong with anything made with these two ingredients! These cookies are impressive yet simple to make. With chocolate cookies it can be difficult to tell sometimes when the cookies are done baking because they do not turn golden brown like other cookies do. You'll want to watch these cookies closely - when they just start to barely crack you should take them out of the oven. They'll continue to bake just a little bit more while they're cooling on your cookie sheet. If you over bake them, they'll still be good, but a bit on the dry side. In a large bowl beat white sugar, brown sugar, butter and 1/4 cup peanut butter, until light and fluffy. Add vanilla and egg, beat until blended. Stir in flour mixture until blended. Set aside. Make the filling: Combine the confectioners sugar and 3/4 cup peanut butter. Beat well with electric mixer until mixture comes together. Roll filling into 30 1 inch balls. Form exterior part of cookie by sectioning dough into approximately 1 tablespoon pieces and then shaping the exterior part of cookie around filling balls. Cover the filling completely. Place 2 inches apart on an ungreased cookie sheet. Flatten with a glass dipped in sugar. Bake at 375 degrees for 7-9 minutes. Allow to cool on cookie sheet for 10 minutes then remove to a cooling rack and cool completely. 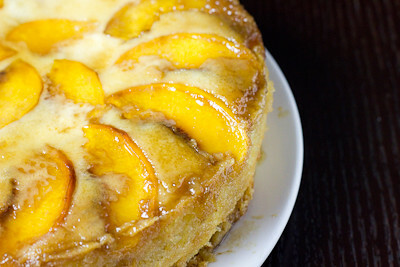 This week's Tuesdays with Dorie: Baking with Julia recipe was hosted by Marlise of The Double Trouble Kitchen and Susan of The Little French Bakery: Nectarine Upside-Down Chiffon Cake. It's been a long, long, time since I've posted for this group - I'm sorry :( I have just been so busy, and on top of that I'm six months pregnant and turning on the oven when it is 100+ degrees outside just hasn't been very appealing. The good news, however, is that my baby girl (who is not so much a baby anymore) just started school this week so that means this mama is going to have a lot more time to bake each week! So, you should start to see blog posts pick up a little more at least. I didn't have a pan large enough for this cake, so I made one large nectarine and peach upside-down chiffon cake and one mini blueberry upside-down chiffon cake. After reading some of the comments on the weekly P&Q, I decided to skip the streusel and made sure to bake my cake for a few extra minutes. I really think the longer baking time has to do with whether or not the cake is baked on a jelly roll pan. I did not bake mine on one and I think it only took an extra 3-5 minutes to bake. I did, however, cover the bottom of my pans with foil to catch the butter drippings, which was good because there was quite a bit. The blueberry cake was delicious. The chiffon was light and airy, as it should be. 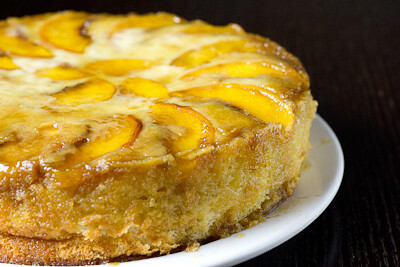 It's a nice contrast to the denser, more traditional pineapple upside down cake. I'm not sure how the nectarine and peach cake turned out because that one will be going with my husband to work tomorrow, but I imagine it's just as good as the blueberry cake. Thanks to Marlise and Susan for hosting; you can find the recipe on their blogs here and here. Make sure you check here, too, to see what everyone else thought of this sweet, end of summer treat. - If you bake your cake on a jelly roll pan, be sure to add at least another 10 minutes of baking time to your cake. Definitely don't forget to wrap the bottom of your pan in foil, or you'll end up with a big mess on the bottom of your oven. 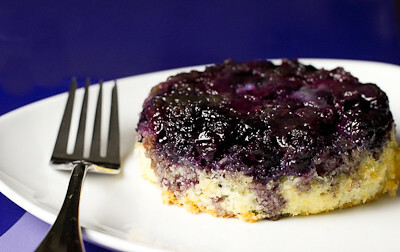 - Frozen blueberries work great with this recipe. Do not thaw before baking. - For more recipe notes, check here. 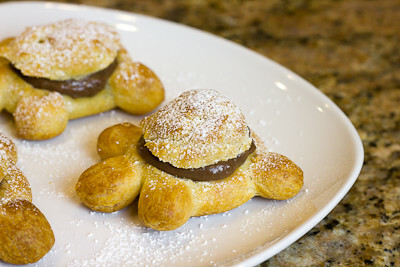 I've made pate a choux several times in the past before, but it had been quite some time. As such, I didn't catch that a key piece of information was missing from the recipe until my dough turned out like soup! :( The recipe states that you are to melt the butter in water, milk, and salt. Then remove the saucepan from the heat and add the flour. Well, it doesn't say if you're to melt the butter over low, medium, or high heat so I did it over medium heat. Unfortunately, if your liquid isn't boiling when you add the flour, it won't cook the flour and you end up with a soupy mess instead of a beautiful pate a choux dough! So, I've added those notes to the recipe so you can avoid that fatal mistake if you make this recipe. Otherwise, everything went off without a hitch. 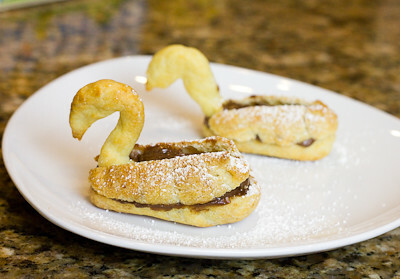 I made a few swans and then loved the idea of making some turtles as another Daring Baker had posted in our private forum. 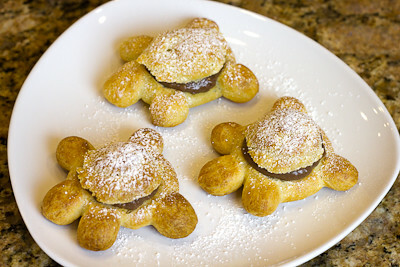 I filled my pastries with chocolate pastry cream and they were delicious. Thanks Kat, for hosting this month's challenge. You'll find the recipes below. Also be sure to check out the Daring Bakers' Blogroll to see all the other wonderful creations that were made! In a small saucepot, combine butter, water, and salt. Heat over until butter melts (and liquid has come to a full rolling boil), then remove from stove. Freezing/Storage Instructions/Tips: While the crème filling stores well when covered tightly and kept in a refrigerator, the baked choux does not store well at all, especially after being filled. Therefore, you must eat these the day they are made. This won’t be a problem, though, I assure you.